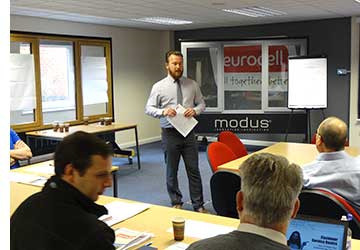 Continuous Improvement is a concept that applies to training as well as every aspect of the Eurocell business, writes David Leighton-Berry of Learning & Development. As a fast-growing company that is constantly evolving and innovating it’s very important to provide the right training, for the right person and at the right time. And that means that, as a department, we have to become more agile and responsive. We’re now in the early stages of an initiative that enables us to do just that. In harnessing the expertise of those at the sharp end, who know what is required far better than any outside consultant. And that’s what we have done with a programme that equips the managers of a department to design and deliver training that addresses their needs. The first cohort of volunteers came through our three-day training session in April. They got to grips with identifying learning needs and then developing content to meet these needs with tools such as coaching sessions, workshops, training videos, e-learning courses. And they were drawn from all parts of our business such as Production Operations, Purchase Ledger, Payroll, Warehousing and Distribution. The idea is not simply to make the L&D team effectively redundant or to give hard-working managers yet another job – far from it. We want to deliver our skills and experience in a smarter and more effective manner. We ‘train the trainers’ but we don’t just send them back and leave them to it. Instead, we provide the support so that they can create the right materials in a timely, cost-effective manner. We believe that our approach is a ‘shorter route to market’ for our learners, with our training professionals back in their own departments and developing training tools that will satisfy their needs. Aaron O’Neill, for instance, our new Production Trainer at our Head office and Merritt Plastics, is creating in depth training sessions and workshops for Clover Nook and Merritt with the support of the L&D team. Hayley Bedward, Purchase Ledger Manager, even has her own test case study going on – a new starter called Alauna Cripwell – for her materials. Hayley has created training videos, Standard Operating Procedures, lesson plans and learner evaluation reports to support her team with some of the SAP processes and instruction on how to deal with queried invoices. The aim is to have full training and induction programmes for her various departmental roles in place by the end of 2017. Early feedback is positive, as Alauna says that she has begun what she calls ‘proper work’ a lot earlier than she expected and that the training aids and self-help guides mean that she can ‘refresh’ her new skills without having to ask someone else in the department how to do things all the time. This early success is an important guide to our future work. In a changing world of Learning & Development, with many different solutions to hand, there is now no conventional way to delivering training. These first trainers will play a key part in Eurocell’s success for many years to come.